Are you wondering if you need to see an eye doctor for vision correction in Chicago because of your deteriorating eyesight? If so, then you may benefit from knowing more about glaucoma, which refers to several eye diseases that affect the optic nerve. Continue reading to learn about the types of glaucoma. The most common form of glaucoma in the United States and Canada, open-angle glaucoma (OAG) is characterized by worsening sight in both eyes that usually occurs slowly and even unnoticeably. In the case of OAG, the symptoms develop so slowly that it’s not uncommon for them to go unnoticed until the person’s vision is severely deteriorated. Often, this is because one eye can be more affected than the other and the one that’s in better condition makes up for the discrepancy. With open-angle glaucoma, peripheral eyesight tends to deteriorate before the central vision. Less common in the United States and Canada than OAG and affecting only one eye, closed-angle glaucoma (CAG) can come on suddenly and can even result in a medical emergency. However, CAG symptoms can also be mild and can cause blurry vision that comes and goes and is short-term. 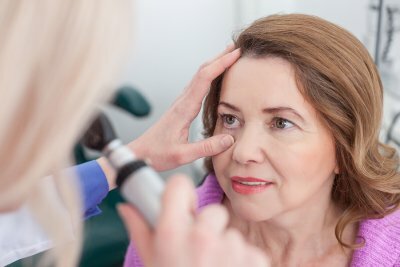 When severe, the signs of CAG can include episodes of blurred vision that last for longer periods and can include pain that’s felt around or in the eye. Some other symptoms of closed-angle glaucoma include nausea, red eyes, and seeing colorful halos around lights. If you notice that your vision is suddenly blurry, see an ophthalmologist at an eye care center right away. Occurring in infants at birth and sometimes in children and young adults, congenital glaucoma is the rarest type of this eye disease. An individual suffering from this condition may have symptoms that include eyes that water a lot and are sensitive to the light. If a child has congenital glaucoma, you may notice that she often squints, closes her eyes, or rubs her eyes. If you notice these behaviors in your baby, she should be seen by an eye doctor as soon as possible.